Today I feel a little homesick as I think about the festivities that will occur in my home country tomorrow. 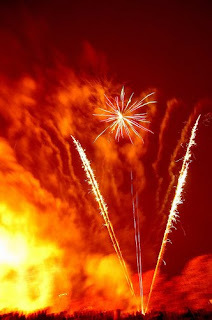 November 5th is a holiday in England called Bonfire night, or Guy Fawkes night. I won’t bore you with all the details but the gist of the history behind the holiday is that a band of dissenters led by a man called Guy Fawkes attempted to blow up King James I and his men with a large amount of gun powder in 1605 (he was Scottish – it’s a long story) . Mr Fawkes was caught before he got the chance to light the fuse (his cousin betrayed him) and we celebrate the fact every year by setting off fireworks and lighting big bonfires. Some people even make a Guy Fawkes model out of hay and throw it on the bonfire too. It’s one of those twisted traditions that it is best not to really think about – needless to say it’s a lot of fun. Although most towns organize a large bonfire and firework display for the public to attend, lots of people choose to hold their own bonfire night in the back garden. It’s certainly a fire risk (although England is mostly damp) and every year people blow off their fingers, but it’s also very exciting. My family takes it pretty seriously. My mum and nana combine to cook soup, chili, baked potatoes and parkin (a kind of delicious gingerbread) while my dad and granddad are in charge of the fireworks. Like kids in a candy store, they pick out the biggest explosives we can safely ignite in our small back yard and then everyone drinks tea or beer and watches as their money goes up in colorful clouds of smoke! It’s essentially an excuse for people to get together and have a fire and that’s why I think I like it so much. There’s something very pagan and honest about it… and who doesn’t like fireworks?